Look at this woman. What is she doing? This is a traditional bakery technique from Sardinia. It requires the skills of a virtuoso harp player and the strentgh ofr a craftsman who knows he has a place inside a community. Here are some of the results, and as you can see from the faces of the people looking at her it’s not just regional cuisine at its best; it’s a performance with a sort of inner musical quality, it’s an experiment on design and it is a powerful activator for a community gathering. This is why this kind of things are welcome in a museum. And in fact this event was the finissage, the closing event, of an exhibition called “The Food Project. The shape of taste“, produced by the Mart Museum in Italy, of which I’ll talk in detail in a minute. I chose to start at the end, because I believe this is a powerful image, and because what I want to share with you today is precisely this: how an original exhibition concept, a change in leadership and a dramatic budget cut have given us the opportunity to become more responsible, to improve overall quality, to adopt sustainable practices, to get rid of unfit policies, to engage local communities and to reach new audiences. I am Luca Melchionna, Luca is the name and Melchionna is the family name, and I work at the communication department of the Mart, the Museum of modern and contemporary art of Trento and Rovereto, in Italy. We’ve got lakes, mountains, we’re a reserved shy bunch of mountain people. But we are curious. And we’ve got museums. “Progetto Cibo. La forma del gusto” – that means “The Food Project. The shape of taste” – was an exhibition curated by Beppe Finessi from an original idea by our director Cristiana Collu between february and june 2013, and it was a huge success for us. We had 30.000 visitors in two months, good reviews from italian and international press, a 72% increase of our web traffic, 540 tweets with the associated hashtags, and what really matters in the end, the love of our community. 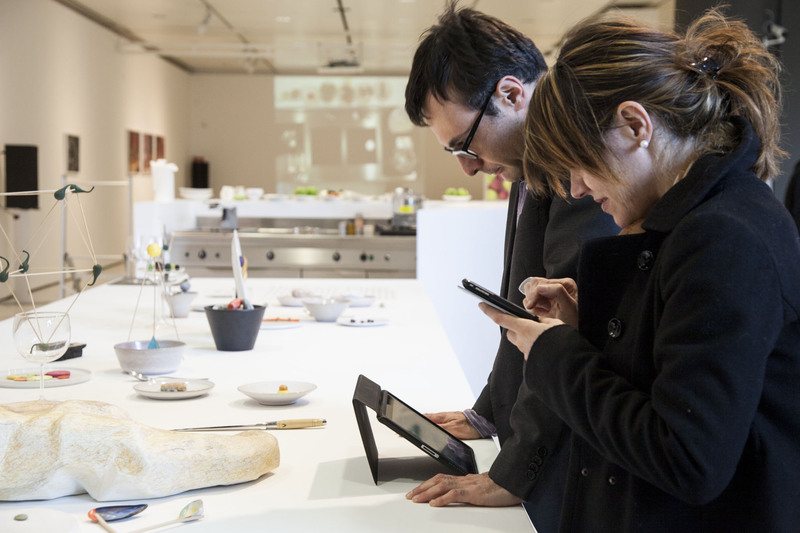 The exhibition brought together food and design on a variety of topics. Just to name one, the project aimed at showing how anonymous food like sushi or strudel, but also lasagna or liquorice rolls frequently conceals a planning approach that is the result of a careful compromise between image, taste and production. Uli Westphal, a featured artist from Germany, says all food is designed, because humanity selected them over the centuries for their shapes, not just for their taste. Concepts like that proved to be very attractive to our audience: all this was not just about “art”: it was a sort of celebration of the beauty of applying design to something that reconnects us with our senses – food. Our director likes to think of our Museum as “The center of the world”; which is not about identity but about the willingness of making sense of the world. “I am at the center of the world” is what the warriors of the Kwakiutl, a native american tribe, said when establishing into a new territory. From his point of view, building your home is not something to be taken lightly. It repeats the foundation of the world; it unleashes again the energies released by the gods during the creation; it resets time and makes it possible to distinguish between different leveles of reality and of moral values, and therefore to defeat relativism, which is not a contemporary sin but an ever-looming human pitfall that can prevent from taking action. To engage with local communities we did this: we placed a kitchen inside the exhibition halls, contacted some great italian chefs and local quality producers of wine, apples, pasta – the best our region has to offer; then contacted food bloggers, hotel and design schools, kitchenware producers, local restaurants, tourism associations, organized groups and we produced a series of events called Martcooking. The chef swere cooking inside the exhibition, talking about their creations and having fun. Local producers were enthusiast. One of them, the Felicetti pasta makers produced a type of pasta which resembles the shape of the dome of the Mart. We did reach a new level of authentic engagement with our local communities, and we managed to reach an international audience through specialized press. I am a southern european so I am not expected to back my claims with solid figures but just with liquid emotions, and this is precisely what I’ll do, I’ll show you a couple of tweets and maybe more. This is a visitor documenting a poetry reading event. She writes she likes “Art, poetry, onions and onionness”. I’ve got nothing to add to a line that combines – possibly for the first time since the dawn of mankind – poetry and onions. While this is Daniel Stier a photographer of an international magazine called NOWNESS. He used the exhibition halls as a photographic set. It was very wild, and very glamorous, and the result was top class. Oh this is a blogger that answered to our youtube contest “do your own version of the chef’s recipes”. I can’t say it was a real success, because it was the only entry in the contest. That was an obvious failure in our social media strategy, which was indeed a central point in our desire to reach and engage new audiences. We wanted to aim high, like the native american warrior did. If everything you do creates meaning and reality then you must aim high and do what is right, even if nobody notices. Bureaucracy is not a problem of low technology but of low moral standards. So we tried to produce a great exhibition display, thanks to architect Gianni Filindeu. It takes a lot of work to do things the right way, and that’s good. We asked a duo of gifted illustrators from Bologna, called Housatonic, to draw the contents of the exhibition’s catalogue on the wall: look at that. And we tried to produce high quality documentation, thanks to photographer Fernando Guerra. He has a very subtle way of capturing audience behaviour. “Become responsible” of course also means acting in a sustainable way: if you work with, and not against, the energy of people and places, you can manage that energy and ride that wave. Remember the kitchen in the exhibition halls? We did not pay for it. We reached a marketing deal with the manufacturer. The actual food needed for the events and for the exhibition itself was donated by local producers and catering schools. Local producers of chocolate and fruit for example gave us the raw materials for a workshop of an artist who creates jewellery that is supposed to melt on your body and then be eaten. There was a lot of bread in the exhibition. It was produced by a catering school, replaced often, and it smelled delicious. Well, there was a lot of wine too. Some of the chefs invited asked for prices we could not afford. We invited younger chefs, and we probably gained twice in enthusiasm and closeness to reality what we lost in tv screening opportunity. We tried to find ways to raise money too. The events and the sponsorhip programmes raised around 80.000 euros. It is not easy to have a fair estimate because in many case our share was a service or a products, but I think it’s a fair guess. We also organized special dinners as a part of our membership program. We made a deal with the Milan design week to showcase a part of the exhibition on their premises. There are things which often seem impossible to achieve, in an italian museum. Whenever a prospective change is involved, you get this reaction: “you can’t do that”. You waste your time fighting all the time with minor rules. The problem with minor rules is of course that they often contradict major rules, which are more important. But when you meet a minor rule fetishist, this argument just does not seem to work. However, if you have a strong mission, then you also have a strong argument. Standing by your mission gives you the power to overrun minor rules, because the minor rule fetishist will not fight against the mission, not because he believes in it, but because he sees it as yet another layer of bureaucracy,which is fine for him. This is how we have developed a social media strategy as a *museum* which was and still is as far as I know something unique in my country. Every department of the museum is in it. Why shouldn’t it be like that? After all, every department contributed to the Food Project exhibition itself. The education department produced workshops with the artists. Our archives, which hold documentations regarding futurism and other important XXth century avant-gardes, had found interesting material on the subject. For exactly this same reason, the various professionals of the museum should and could join in the debate on this subjects, that exists on the web, and sometimes is really engaging – search “food” on Pinterest if you like. Our aim was therefore not to develop a really cool digital event. It was to slowly embrace digital from within in a museum where 90% of our staff members, regardless of age, refused even to consider the existence of anything digital. With the director support, and after very engagin talks, we managed to develop a “web team”, an informal group of people from all departments that uses the web to listen to meaningful debates and to publish relevant contents about their work. They’re nine, and they now have their own digital professional lives. During the “The Food Project” as a team we developed a detailed strategy, using a variety of sources, including Jasper Visser‘s Digital Engagement Framework, tailored to our necessities. Our Archives opened a Tumblr blog and populated it with images of artists using food for their performances, or just eating. One of the artists recognized his own signed napkin and contacted us. On Youtube as I said we failed – but not too much I will add now because since that moment our photographic archive has begun shooting, editing video, uploading it to youtube and tweeting it. They have become autonomous, and the total youtube views of all the Food Project related videos was 21.000, which is not bad. It has to be noticed that on instagram and twitter we had more success in reaching the stage of active engagement with some influent bloggers. None of this was done by marketing men. Our goal was not to have the most efficient social media campaign of the world, but to be on the web as a museum, as we are. All of this was done on a volunteer basis by members of the staff who wanted to developed their own Food Project. Nearly everything we did violated a minor rule – for example the use of social media is formaly banned at the Mart. We all are aware that it’s not about technology, it’s about the mission. At the Mart in 2013, like in most italian museums, photos inside the exhibition halls were forbidden. Why? Nobody really knows. The communication department wanted to change that. The new director wanted to change that. Even the archivists wanted to change that, for Christ’s sake! And yet the legal issues involved were driving us mad. During “Progetto Cibo” there were a couple of tweets complaining of this. This is one of them. I made a point to myself: this had to be the last time. What really changed everything was having that kitchen inside the exhibition halls. Photos inside the halls were formally forbidden. So what we basically did was to change policies for the following exhibitions, even if we had not resolved the legal issues. We had the support from our director. We had a line in the museum’s funding statement which says “The aim of the museum is to advance knowledge” – and we now know that the act of taking a photo is an appropriation attempt, basically a desire of making sense of the world. And we now had the documented love of our community. So the trick is, don’t pick technology as your weapon, pick something that is of value for your community – for us it’s food – show that this brings added value, and let the people sneak technology in it. So we revised our policies, and from that moment onward photos as a rule are permitted and encouraged at the Mart. We are also developing iconic suggestions of other things which you can do, such as recharging your smartphone or talking aloud. And we are working with a wikipedian in residence to improve our copyright policies, in order to make them more in line with our mission.